It is a generation project, which will transform the city's image: In the next 30 years, the Canton, the Confederation and the universities plan in the centrally located University quarter, several new buildings, Parks and a Campus Boulevard. The investment amounts to more than 4 billion Swiss francs. Now this large project is an important step forward: The special Commission for building construction and city development in the Zurich city Parliament, with the plans for the renovation of the high school district's agreement in principle has agreed to the necessary adaptation of the urban building and zoning regulations (BZO) with a large majority, as you tells. The city Council will be on 15. May decide. "Thus, the Council creates the basic order, in order to secure the future of the universities in the centre of Zurich," says Commission President Patrick Hadi Huber (SP) on request. The Commission, however, that the municipal Council had been involved in the planning process in the University, much too late, and to say little. To be able to have more voice and concerns of the population and incorporate, calls you, acting unanimously on a General design plan obligation. the Canton, the Confederation and the universities would have to uphold in the high school district "vision and the More compression with prudence meet," writes the Commission. The expansion of capacity in a densely populated area requires a special area management. Good quality green spaces, street spaces and Wegverbindungen should therefore be secured with a special article in the BZO. In order for the Commission to respond to resistance from the local population, which criticized some of the new construction projects as too high and bulky. A minority of SVP, Green, and AL demanded that the Commission's more stringent regulations for the preservation of the city image, including the tiered zoning. For the majority however, this was "not constructive". The required height gradation would be a brake on the further development and would be contrary to the overarching structure plan. in Addition, the universities have reduced the new buildings in terms of height and volume, in the meantime, already as far as possible, such as in January, the projects presented for the educational and research center by Herzog & de Meuron and for two new buildings for the University hospital of Christ & Gantenbein. 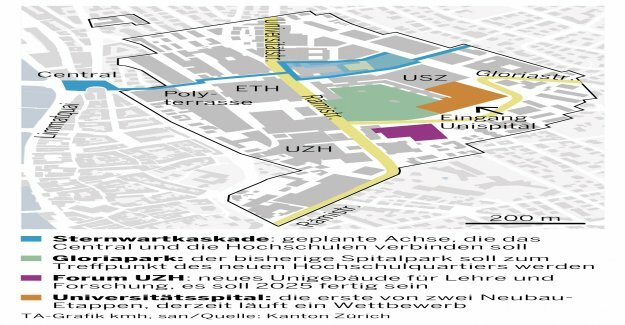 there is consensus in the Commission of the historic wing of the University hospital, a construction of the Zurich-based architectural pillar saints Häfeli/Moser/Steiger. The government considers this as worthy of protection, the parliamentary Commission wants to leave the hospital in a technically obsolete part of the Building not to protect and requires the city Council that he is committed to the governing Council accordingly. Satisfied, the Commission is, finally, that the Canton and the Confederation of the claim descendants to use by offices occupied apartments in the University area again in the future as apartments.